One of the best ways to rejuvenate passion for your hometown is to see it through another person's perspective. San Francisco walking tours are an exceptional way to introduce your visitors to SF, and at the same time, add some historical and cultural facts to your own knowledge bank. Get ready to experience the city in a whole new way. 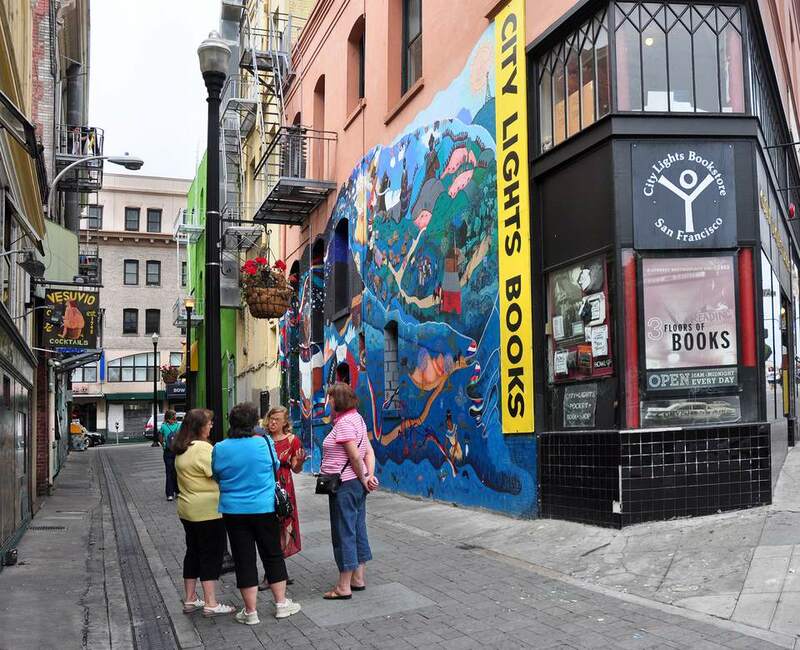 The walking tours offered by non-profit SF City Guides are an amazing resource for both San Franciscans and visitors alike. Not only do they offer a large range of themed walks citywide, but the tours are also free (though the do accept donations for their organization). Volunteer guides lead participants on strolls through time and history, from the haunted corridors of San Francisco City Hall to the Art Deco-lined streets of the Marina District. This is a city with a lot of greenery, both within SF limits and in the greater Bay Area, and it's ready and waiting to be explored. The state, and U.S. park systems are fantastic resources for free guided walks and hikes, as well as other nature and history-oriented tours and talks. A great local resource is the Golden Gate National Park Conservancy, which provides a schedule of guided outings as well as stewardship programs. The Presidio also offers an ongoing schedule of active events. Chocolate connoisseur Andrea Nadel started Gourmet Walks' Chocolate Tours in 2007, and they've been winning hearts since. For anyone who loves chocolate, here's an opportunity to fully indulge. The Gourmet Chocolate Tour includes loads of delicious samples, including a decadent chocolate velvet cupcake and unshelled truffles, while a highlight of the Ultra Chocolate Tour is a wine and truffle flight (the tour is for those 21+). Both tours include multiple hours strolling through downtown SF, as well as some wonderful local history. Gourmet Walks also leads food-centric tours through some of the city's other culinary neighborhoods, including Russian Hill and Hayes Valley. Wok Wiz has long won accolades as one of San Francisco's best walking tours, and for good reason: these daily tours let you experience Chinatown like a local, accompanied by a guide who speaks Cantonese. Stop include neighborhood herb vendors, an authentic Chinese temple, back alleyways, and the beloved Golden Gate Fortune Cookie Factory, and your guide can also offer tips on the best spots to shop for souvenirs. In addition, Wok Wiz hosts a popular "I Can't Believe I Ate My Way Through Chinatown" tour, complete with a traditional Chinese breakfast and a hosted family-style Chinese lunch. "Vampire" Mina Harker (aka Kitty Burns) leads this somewhat alternative tour once a month along the streets of tony Nob Hill, interspersing vampire lore and legend with tales of the area's colorful and affluent history. Stops include the Fairmont Hotel, the Pacific-Union Club, and Grace Cathedral. Although on hiatus for winter, Ms. Harker will resume her antics in May. Ready for a tour that's as entertaining as it is enlightening? Foot! guided tours are led by comedians who make it their mission to both inform and amuse in the context of an interactive walk. Themes include "HOBNOBBING WITH GOBS OF SNOBS: the stinkin' rich and dirty money that built Nob Hill," and "FULL EXPOSURE: A revealing tour of the never-changing identity of North Beach." Set out on an intimate tour of one of the world's largest lesbian, gay, bi-sexual, transgender, and queer (LGBTQ) communities: San Francisco's Castro District, and learn about the role that it played both in LGBTQ culture and in U.S. Civil Rights. Along the way you'll delve into the world of California's first openly gay politician, Harvey Milk; see America's first Rainbow Flag, and walk the streets of history and an easy and informative stroll. Get a glimpse at San Francisco's present Haight-Ashbury neighborhood and some major insight into its past with the Flower Power Walking Tour: a 12-block traverse of both hippiedom and general history, along with details on the neighborhood's fabulous Victorian architecture. Tours take place on Tuesdays, Fridays and Saturdays. The exhilarating San Francisco Ghost Hunt is an evening amble through the lovely streets of Pacific Heights, where you'll learn the stories behind some of the city's most notorious places. Halloween is an especially popular time to take the tour, so if you prefer a smaller clan, choose a week that's a little less (ahem), haunting. They take place every evening except Tuesday, rain or shine. San Francisco's Victorian Home Walk is an easy jaunt through the city's luxe Pacific Heights neighborhood, providing insight into its lovely Victorian architecture as well as tips on distinguishing the different styles. More than 200 homes—including the one from Mrs. Doubtfire—line the tour route, which also features a look at a Queen Anne interior. Walks take place daily, rain or shine.